Melwani, A. R.; Greenfield, B. K.; Targgart, L.; Kellogg, M. 2009. Patterns in Mercury and Trace Organic Contamination of Sport Fish and Sediments in San Francisco Bay Compared to the Offshore Coast. Greenfield, B. K. 2009. Patterns in Mercury Update by Small Fish. Harrold, K. H.; Yee, D.; Sedlak, M.; Klosterhaus, S.; Davis, J. A.; Woudneh, M.; Riley, P. 2009. Pharmaceuticals and Personal Care Products in Wastewater Treatment Plant Influent and Effluent and Surface Waters of Lower South San Francisco Bay. San Francisco Estuary Institute: Oakland, Ca. Cloern, J. 2009. Recent Trends of Phytoplankton Increase in San Francisco Bay. Lowe, S.; Jr., D. L. Stevens. 2009. Redesign of Sediment Stations to include Wet Weather Sampling. Mumley, T. 2009. Regulation of Sediment and Sediment Quality. Askevold, R. A. 2009. Reoccupying historical maps to recreate historical landscape. McKee, L. J. . 2009. Review of sediment gauging in Alameda Creek Watershed in relation to District needs. SFEI Contribution No. 571. Collins, J. N.; Cayce, K.; Williams, M. 2009. Riparian Area Mapping Model Overview. Greenfield, B. K. 2009. Risk assessment case study of DDT in Newport Bay. McKee, L. J. .; Feng, A.; Sommers, C.; Looker, R. 2009. RMP Small Tributaries Loading Strategy. San Francisco Estuary Institute: Richmond, CA. 2009. San Francisco Bay Sport Fish Monitoring, 2009 and Beyond. Eagles-Smith, C.; Hunt, J.; Ackerman, J.; Davis, J. A.; Sedlak, M. 2009. San Francisco Bay Triennial Bird Egg Monitoring Program for Contaminants - 2009 Data Summary. U. S. Geological Survey: Davis, CA. Pearce, S.; Bigelow, P.; McKee, L. J. .; Gilbreath, A. N. 2009. A Sediment Budget for Two Reaches of Alameda Creek: support for flood control channel management. McGrath, J. 2009. Sediment Happens - But not so Much. Greenfield, B. K. 2009. Sediment Quality Objectives For Indirect Effects. Greenfield, B. K. 2009. Sediment Quality Objectives For Indirect Effects Update. Jabusch, T. W.; Gilbreath, A. N. 2009. Summary of Current Water Quality Monitoring Programs in the Delta. San Francisco Estuary Institute: Oakland, CA. Stanford, B.; Ridolfi, K.; Greenfield, B. K. 2009. Summary Report: Green Sturgeon, Longfin Smelt, and Dredging Operations in the San Francisco Estuary. SFEI Contribution No. 598. San Francisco Estuary Institute: Oakland, Ca. Schoellhamer, D. 2009. Suspended Sediment: Past a Tipping Point – What’s Next?. David, N. 2009. Sustainable Cotton Project. SFEI Contribution No. 592. San Francisco Estuary Institute: Oakland, Ca. Davis, J. A. 2009. Water Quality in the Bay: 2009. McKee, L. J. .; Lewicki, M. 2009. Watershed Specific and Regional Scale Suspended Sediment Load Estimates for Bay Area Small Tributaries. SFEI Contribution No. 566. Oakland, Ca. SFEI. 2008. 2008 Pulse of the Estuary: Monitoring and Managing Water Quality in the San Francisco Estuary. SFEI Contribution No. 559. San Francisco Estuary Institute: Oakland, CA. McKee, L. J. . 2008. Advances in Understanding of Loads of Mercury and Other Pollutants to the Bay. David, N.; Eacock, M. C. S.; McGahan, J. C.; Beckon, W. N. 2008. Agricultural Drainage through the Grassland Bypass Project. McKee, L. J. .; Collins, J. N.; Pearce, S.; Gilbreath, A. N.; Bigelow, P.; Ridolfi, K. 2008. Alameda Creek Sediment Forum. Stapleton, H.; Allen, J.; Kelly, S.; Konstantinov, A.; Klosterhaus, S.; McClean, M.; Webster, T. 2008. Alternate and New Brominated Flame Retardants Detected in US House Dust. Environmental Science & Technology. Greenfield, B. K.; Siemering, G.; Hayworth, J. D. 2008. Assessment of Potential Aquatic Herbicide Impacts to California Aquatic Ecosystems. Archives of Environmental Contamination and Toxicology . SFEI Contribution No. 539. Rothenberg, S. 2008. Atmospheric Mercury - Loads from Local Sources. San Francisco Estuary Institute. 2008. California Rapid Assessment Method (CRAM) Fact Sheet, Level 2, State version. SFEI Contribution No. 562. p 2 pages. San Francisco Estuary Institute. 2008. California Rapid Assessment Method (CRAM) Fact Sheet, Level 2, State version, 2 pages. Stapleton, H.; Konstantinov, A.; Klosterhaus, S. 2008. Characterization of the brominated chemicals in a PentaBDE replacement mixture and their detection in biosolids collected from two San Francisco Bay Area WWTPs. Stapleton, H.; Konstantinov, A.; Klosterhaus, S. 2008. Characterization of the brominated chemicals in a PentaBDE replacement mixture and their detection in biosolids collected from two San Francisco Bay Area Waste water treatment plants. San Francisco Estuary Institute. 2008. CMARP Phase III Technical Support: Highlighting Monitoring Activities and Recommendations for Addressing Shortfalls and Improving Monitoring Coordination in the Delta-Suisun Bay Planning Area. SFEI Contribution No. 565. Department of Fish and Game, Central Valley Bay-Delta Branch, Ecosystem Restoration Program. Hunt, J. A.; Davis, J. A.; Greenfield, B. K.; Melwani, A. R.; Fairey, R.; Sigala, M.; Crane, D.; Regalado, K.; Bonnema, A. 2008. Contaminant Concentrations in Sport Fish from San Francisco Bay, 2006. SFEI Contribution No. 554. Oakland,CA. Oram, J. J. 2008. Cool New Tools for Accessing RMP Data. Collins, J. N.; Grenier, J. Letitia; Sutula, M. 2008. Developing Tools to Help Protect and Manage California Wetlands, Streams, and Riparian Resources. Jabusch, T. W.; Swanson, T.; Pawley, A.; Hoenicke, R. 2008. Development of an environmental indicator system for watershed-based decision-making and tracking the outcomes of beneficial use restoration in the San Joaquin River basin. SFEI Contribution No. 556. Goldbeck, S. 2008. Dredging and Sediment Management in San Francisco Bay. Jabusch, T. W.; Melwani, A. R.; Ridolfi, K.; Connor, M. 2008. Effects of Short-term Water Quality Impacts Due to Dredging and Disposal on Sensitive Fish Species in San Francisco Bay. SFEI Contribution No. 560. San Francisco Estuary Institute: Oakland, Ca. Klosterhaus, S.; Sedlak, M.; Harrold, K. H. 2008. Emerging Problems? progress of Identifying Contaminants of Concern in the San Francisco Estuary. Lowe, S.; Grosso, C.; Ross, J. R. M. 2008. Exchange and Integration of Monitoring Data to Address Management Questions at Multiple Scales. Cohen, A. N.; Weinstein, A. 2008. Exotic Oyster Survey, Removal and Research in San Francisco Bay: Annual Progress Report. Frontiera, P. 2008. Flamenco + Geo: extending a search interface based on hierarchical faceted metadata. Oram, J. J.; Davis, J. A. 2008. A Forecast Model of Long-Term PCB Fate in San Francisco Bay. SFEI: Oakland, CA. p 52. Greenfield, B. K.; Connor, M. S.; Bay, S. M. 2008. Frameworks to evaluate human health impacts of contaminated sediments. Oram, J. J.; McWilliams, J. C.; Stolzenbach, K. D. 2008. Gradient-based edge detection and feature classification of satellite images of the Southern California Bight. Remote Sensing of the Environment. Remote Sensing of the Environment. Vol. 112. Committee, G. Bypass Pro. 2008. Grassland Bypass Project Report 2004-2005. SFEI Contribution No. 553. Lent, M. A.; Oram, J. J.; McKee, L. J. . 2008. Guadalupe Watershed Model. Lent, M. A.; Oram, J. J.; McKee, L. J. . 2008. Guadalupe Watershed Model. Phase: 1 Hydrology Model. Greenfield, B. K.; Rajan, M.; Darrow, J.; Hua, M.; Barnett, B.; Mendoza, M.; Andrews, J. C. 2008. Hg L	3 XANES study of mercury methylation in shredded Eichhornia crassipes. Environmental Science and Technology. Connor, M. 2008. The Implications of Sediment Quality Objectives for San Francisco Bay Management. Melwani, A. R.; Thompson, B. 2008. The Influence of Chemical and Physical Factors on Macrobenthos in the San Francisco Estuary. SFEI Contribution No. 543. Melwani, A. R. 2008. The Latest on Human Exposure: Mercury Contamination in Bay-Delta Sport Fish. Oram, J. J.; McKee, L. J. .; Grace, R.; Werme, C.; Connor, M. S.; Rodigari, F.; Oros, D. R. 2008. A Mass Budget of Polybrominated Diphenyl Ethers in San Francisco Bay, CA. Environment International. Greenfield, B. K.; Davis, J. A.; Ichikawa, G.; Stephenson, M. 2008. Mercury in sport fish from the Sacramento-San Joaquin Delta region, California. Science of the Total Environment 66-75 . SFEI Contribution No. 537. McKee, L. J. . 2008. Mercury Sources in Local Watersheds. Greenfield, B. K.; Lent, M. A.; Slotton, D. G.; Ayers, S. M. 2008. Modeling mercury accumulation in largemouth bass. Greenfield, B. K.; Lent, M. A. 2008. Modeling mercury bioaccumulation in largemouth bass in the Sacramento-San Joaquin River Delta and tributaries. SFEI: Oakland, CA. p 22. Oram, J. J.; Davis, J. A.; Leatherbarrow, J. E. 2008. A Model of Long-Term PCB Fate in San Francisco Bay. San Francisco Estuary Institute: Oakland. 2008. 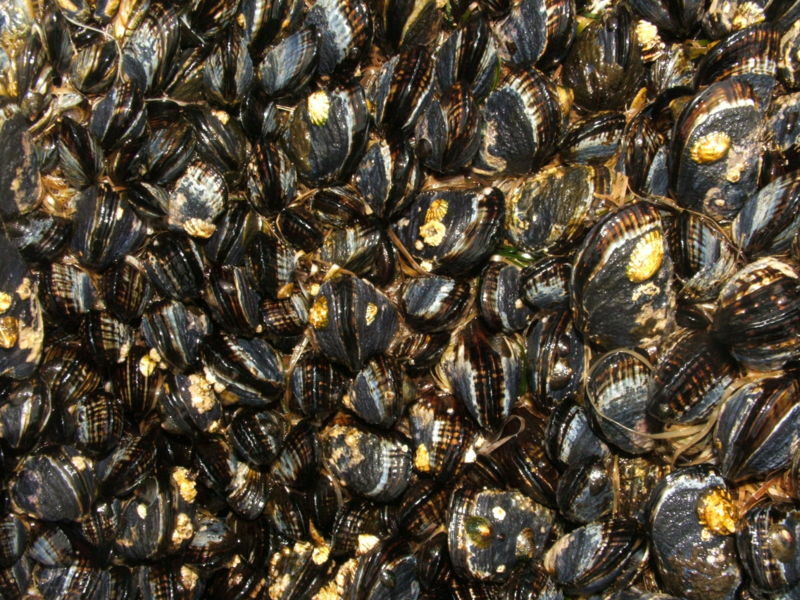 Mussels - Miesmuscheln Mytilus. Betts, K. 2008. New flame retardants detected in indoor and outdoor environments:New research suggests that a flame retardant marketed as a replacement for a banned and discontinued PBDE retardant can be found in people’s homes and the outdoor environment..
Oram, J. J.; Hunt, J. 2008. PBDEs in the Bay: Rapid Rise, Rapid Fall?. Sedlak, M.; Greig, D.; Grace, R.; Riley, P. 2008. Perfluorinated Compounds in San Francisco Bay Harbor Seals. McKee, L. J. .; Pearce, S.; Shonkoff, S. 2008. Pinole Creek Watershed Sediment Source Assessments. Melwani, A. R.; Greenfield, B. K.; Jahn, A.; Oram, J. J.; Sedlak, M.; Davis, J. A. 2008. Power Analysis and Optimization of the RMP Status and Trends Program. SFEI Contribution No. 555. Davis, J. A. 2008. Recommendations for a Bioaccumulation Monitoring and Human Health Risk Reduction Program for California. SFEI Contribution No. 545. Thompson, B. 2008. Relationships among SQO indicators in San Francisco Bay and continuing development of methods. McKee, L. J. . 2008. Review of sediment gauging studies in Alameda Creek Watershed. SFEI Contribution No. 571. San Francisco Estuary Institute. Jahn, A. 2008. RMP Food Web Analysis; Data Report on Gut Contents of Four Fish Species. San Francisco Estuary Institute. Davis, J. A. 2008. The RMP Mercury Strategy. Greenfield, B. K. 2008. The RMP Mercury Strategy: Studies Underway. San Francisco Estuary Institute. 2008. RMP Newsletter Spring 2008. Phillips, B. M.; Anderson, B.; Lowe, S.; Hunt, J. 2008. RMP Sediment TIE Study 2007-2008: Using Toxicity Identification Evaluation (TIE)Methods to Investigate Causes of Sediment Toxicity to Amphipods. SFEI Contribution No. 561. San Francisco Estuary Institute: Oakland, CA. Lowe, S.; Salop, P.; Gehrts, K.; Andreson, B. S.; Philips, B. M.; Bay, S. M. 2008. Sampling in the Freshwater Reaches of the Lower Delta for Sediment Quality Objectives Measures. Lowe, S.; Salop, P.; Gehrts, K.; Bay, S. M.; Anderson, B.; Phillips, B. M. 2008. Sampling in the Freshwater Reaches of the Lower Delta for the Sediment Quality Objectives Measures. UPDATED for CALFED meeting Oct 2008. Lowe, S.; Salop, P.; Gehrts, K.; Bay, S. M.; Anderson, B.; Phillips, B. M. 2008. Sampling in the Freshwater Reaches of the Lower Delta for the Sediment Quality Objectives Measures. McKee, L. J. .; Gilbreath, A. N.; Looker, R.; Mangarella, P.; Yee, D.; Leatherbarrow, J. E.; David, N. 2008. San Francisco Bay Mercury Loads: Scientific information development and management response. Harmonizing River Catchment and Estuary.